Choose your source of power: electricity, hydrogen, or hybrid. Honda hedged its bets on the fuel of the future when it created its Clarity series of vehicles. All three versions use the same mid-size sedan, five-passenger fastback design, but the trio of Clarity cars each have their own specific source of power. There’s a plug-in hybrid, a pure battery-electric model, and hydrogen-powered fuel-cell electric vehicle. Which one is best for you? Read on to see our comparison, which sheds light on the pros and cons of fuel cells, battery packs, and plug-in hybrids. The Honda Clarity Fuel Cell can go 366 miles on a single tank of hydrogen. Clarity Plug-in Hybrid: The Honda Clarity Plug-in Hybrid has an official E.P.A. rating for 48 miles of all-electric driving. In most conditions, nearly all of those miles will be purely on electrons. But in real-world driving conditions, the gas engine will fire up for maximum power as needed, say, for speedy highway onramps. Now that the Chevy Volt is discontinued, the Clarity Plug-in Hybrid becomes the model with the most all-electric range among cars that utilize both the plug and the pump. It’s total range on both gas and electricity is 340 miles. Clarity Fuel Cell: The Honda Clarity Fuel Cell can travel an estimated 366 miles after a quick, five-minute fill-up at a hydrogen fueling station. That amount of driving range and fast fueling is the beauty of hydrogen fuel-cell technology. After a quick trip to an H2 station, a typical driver can forget about range for at least a week. The obvious downside is the lack of hydrogen fueling stations. Honda also only leases the Clarity Fuel Cell vehicle at a dozen California dealerships in regions where hydrogen stations can be found. Clarity Electric: With an electric motor providing the only source of power for the Clarity Electric, it earns an official E.P.A. efficiency rating of 114 MPGe. That beats the other Clarity models for efficiency. The problem with the Clarity Electric is its small battery pack compared to the EV competition. At just 25.5 kilowatt-hours, it only yields 89 miles on a single charge. That’s a generation behind cars like the 238-mile Chevy Bolt. And it’s a deal-killer for most buyers. On a literal basis, the fuel-cell version has the most electric range among Clarity models. Its 366 miles on a single tank obviously beats the 48-mile all-electric range of the Clarity Plug-in Hybrid. However, for practical purposes, the plug-in hybrid is the winner. It has greater overall efficiency than the fuel-cell version, and on most days you would only use a few drops of gasoline. More importantly, it can still function as an efficient 42-mpg hybrid for long trips – with conventional gas stations available on the road. Which Car Is The Most Fun To Drive? When its two sources of power are combined, the Clarity Plug-in Hybrid produces 212 horsepower. Clarity Plug-in Hybrid: The Clarity Plug-in Hybrid combines a 1.5-liter, four-cylinder engine with two electric motors. For a sizable and relatively heavy sedan, it has a decent overall output of 212 horsepower and 232 pound-feet of torque. But that’s when both sides of the powertrain are engaged. When operating just on electricity, the Clarity Plug-in Hybrid makes a less impressive 181 horsepower. Just on gasoline, after depletion of the battery pack, you’re down to 103 horsepower and 99 pound-feet of torque. Still, when power is truly needed, it’s available via both sources of power. Clarity Fuel Cell: There’s a ton of technology that goes into fuel-cell technology and how it converts gaseous hydrogen into electricity. But the Clarity Fuel Cell has a single source of propulsion: a 174-horsepower electric motor providing 221 pound-feet of torque. Is it fun to drive? Moderately. With a curb weight of 4,134 pounds, you can expect it to be slightly slower off the line than the plug-in hybrid at full throttle. Clarity Electric: The purely electric version of the Clarity is the simplest powertrain of the bunch. It has a single electric motor that receives energy from a lithium-ion battery pack. That motor makes 161 horsepower while producing 221 pound-feet of torque. The Clarity Electric is the lightest of the three vehicles at 4,024 pounds. While it keeps pace with its sibling vehicles, the all-electric Clarity lacks the pep found in smaller EVs with bigger motors. While all three models were designed to provide about the same level of performance, the plug-in hybrid’s total output of 212 horsepower gives it a slight edge. That said, Honda never intended any of the Clarity models to be great performers. Their size, narrow energy-saving tires, and quasi-luxurious interior represent a sacrifice in the fun category in exchange for comfort. Refueling the Clarity Fuel Cell takes less than five minutes. Clarity Plug-in Hybrid: The Clarity Plug-in Hybrid uses a 6.6-kilowatt onboard charger. With a 240-volt supply of power, you can add about 20 to 25 miles of range per hour of charging. Replenishing all 48 or so miles of all-electric range takes less than 2.5 hours. Using a standard 110-volt source requires about 12 hours. Filling up the Clarity Plug-in Hybrid’s seven-gallon gasoline tank is standard procedure. Clarity Fuel Cell: The big promise of fuel-cell cars is that refueling works much like filling up a gas-powered vehicle. It takes a few times to get used to handling the bigger nozzle delivering gaseous fuel, but it quickly becomes the new normal. Pull up on empty, attach the nozzle, and four or five minutes later, you have 366 more miles of energy. Unfortunately, given the current lack of hydrogen stations, the time getting to the pump and back is not nearly as convenient as plugging in at home. Clarity Electric: The charger used in the Clarity Electric is the same 6.6-kW as found in the plug-in hybrid. So expect the same rate of charging – about 20 to 25 miles of added range per hour via a 240-volt charging station. Because the battery holds 25.5 kilowatt-hours, expect a full charge from empty to full in less than four hours. Using public chargers equipped with the standard CCS charging port, you can restore 80 percent of the battery capacity in about 30 minutes. Unfortunately, that only equates to about 70 miles of driving until you would need to repeat the process. Hydrogen is dispensed much like gasoline is pumped. The fuel-cell electric version of the Clarity wins the race for fastest fueling. There’s no denying that a five-minute fill-up of a hydrogen car with a 366-mile range can’t be beaten by battery-electric vehicles. Of course, there’s a big caveat: access to charging stations. So while we give the fuel-cell Clarity the prize for fastest refueling, it’s more of a future promise than reality until hydrogen stations are more plentiful. In the meanwhile, anybody living outside Southern California or the Bay Area, where H2 stations exist, should feel good about the ease of plugging in at home. The trunk of the Clarity Plug-in Hybrid doesn’t lose any space to make room for batteries. Clarity Plug-in Hybrid: The Clarity is the largest sedan sold by Honda. It’s a comfortable ride for five adults. Passenger volume and other dimensions are practically identical for the three Clarity versions. Where things diverge is in the packaging of engines, motors, batteries, and energy tanks – and its effect on trunk size. Although the plug-in hybrid shaves off a half-cubic-foot of passenger volume (down to 101.5 cubes), it has the edge regarding cargo space with 15.5 cubic feet. And it offers folding rear seats. Clarity Fuel Cell: Honda engineers had to make room for two scuba-like tanks that store the Clarity’s hydrogen. One of them sits behind the rear seats, which explains why the Clarity Fuel Cell’s trunk is diminished to 11.8 cubic feet. Folding rear seats are also sacrificed. Clarity Electric: The all-electric version of the Clarity also loses some of its cargo capacity to make room for its battery pack. The sacrifice is not as bad as what the fuel cell version gives up. The Clarity Electric offers 14.2 cubic feet of cargo. While the rear seats fold, the pass-through from the trunk is small. The passenger space and creature comforts of the three models are virtually identical. So that’s a tie. The battle here is based strictly on the tape measure. The Plug-in Hybrid doesn’t make any compromises in trunk space. The other two, to varying degrees, give up room for their electric powertrains. The Clarity Electric is available for $199 a month in a three-year lease. Clarity Plug-in Hybrid: The base-level Honda Clarity Plug-in Hybrid starts at $33,400, not including a $7,500 federal tax credit. The list of standard features includes heated front seats, dual-zone automatic climate control, and keyless entry. All models come with a rearview camera, automatic emergency braking, and adaptive cruise control. Rear climate control adds $514 to the price. The Clarity Touring trim, which starts at $36,600, brings creature comforts like leather upholstery and navigation. The Plug-in Hybrid is available throughout the United States. California resident might also qualify for an extra $1,500 rebate. Clarity Fuel Cell: The hydrogen-powered Clarity is available only for lease in about a dozen dealerships in California. With $2,868 due at signing, the 36-month lease costs $369 per month. The lease price factors in the federal incentive. California residents might also qualify for a $5,000 rebate. The Clarity Electric comes with all the features of the Plug-In Hybrid Touring. Considering the current high cost of hydrogen, Honda bundles a three-year Clarity lease with fuel cards worth about $15,000. Free fuel for three years is a great perk. Clarity Electric: The Clarity Electric is the lowest priced version of the model. It’s available only in California and Oregon for $199 a month with a 36-month lease and $1,499 due at signing. The Clarity Electric comes with all the features of the Plug-In Hybrid Touring. California residents also qualify for a $2,500 rebate. An EV with 89 miles of range might not work for everybody, but it’s hard to beat the value of a $199 lease, especially for California residents who receive a check for $2,500 – enough to cover the first year of payments. The plug-in hybrid version of the Clarity rises above the pack. More overall power. A bigger trunk. Wider availability. In addition to those superlatives, the Clarity Plug-in Hybrid provides more all-electric range than any other plug-in hybrid on the market. All versions of the Honda Clarity offer a comfortable and spacious ride. But the Clarity Plug-in Hybrid is the only one that eliminates range issues. The runner-up is the Clarity Fuel Cell. For adventurous Californians who want zero emissions but don’t mind visiting special fueling stations, it’s a fascinating alternative. Where does that leave the Clarity Electric? A mid-size all-electric sedan is needed in the marketplace, but 89 miles of range doesn’t cut it. We look forward to Honda going back to the drawing board to produce a battery-electric model with at least 200 miles of range. 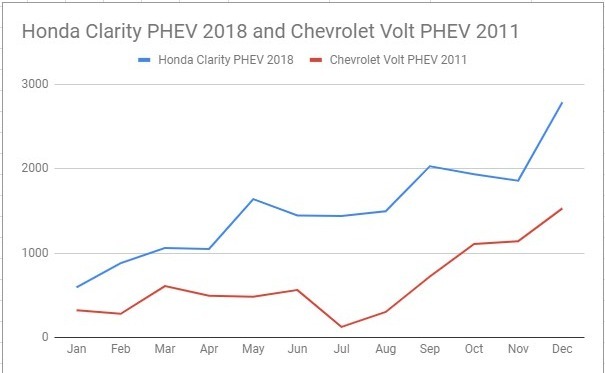 88 Comments on "EV Comparison: 3 Flavors Of Honda Clarity: PHEV, BEV & Fuel Cell"
Clearly this is a California only article, since there is only 1 Honda Clarity available for the rest of us. The other two are local market compliance cars. I am glad Honda decided to make the PHEV for all markets. It is a great car for those that like the looks. Agreed, the PHEV version is a great car. And the recent activity suggests Honda now believes this is the right configuration for most of this country. That’s because their BEV is short range, the HFCV is an HFCV. Agreed. That is the best of the 3, IMHO. It’s also clearly an article only for people with access to an electric outlet where they park when at home. Many people in the U.S. don’t have a garage or dedicated parking space with access to electricity. The LA Times recently had an article about the difficulties of charging up when you can’t do it overnight at home. There was a time when most people didn’t have electricity in their homes, too. Times change, and with the EV revolution will come L2 charge points (or at least 220v outlets) everywhere people park overnight. Yes and I’m willing to bet that electrical utilities will soon start putting in chargers everywhere to sell more of their product. That would be a useful development, but so far, electrical utilities have shown next-to-zero interest in building charging networks. “But maybe by the time I’m ready to buy they will have a pure BEV with a decent range……..?” Would 100 EV Mike’s, in an EREV (Volt Like) PHEV be the practical Minimum “Sweet Spot” for such City Buyers without Home Charging? Or would it take 150 Mike’s & DC Quick Charging? Having Grown up with Propane Power for most of my years to grade 12, we were just 1 7/8’s miles past the power, so basically “Off Grid”, but in 1963, the cost was about $10,000 a mile to connect, or $17,000! So it didn’t happen, until in the Late 1970’s, after I graduated! So, yes, owning an EV, or a PHEV in such a place would have been of little use or advantage! However, City Folk in Condo’s, Apartments, or otherwise Renting, need more flexible Condo Boards, Property Managers, or Landlords, to get a plug to use daily! Difficult, but not impossible! Thanks for the info! I didn’t realize the Clarity Electric (BEV) is only available in California. That helps explain the very low sales. Or rather, it points to Honda not attempting to sell many of them in the U.S.
Also, at 89 Miles of Range per charge (@ 100% SOC), it is about 50-60 Miles below the current Nissan Leaf! If it could get 150 Miles RPC (Range Per Charge), and still be had for under $2,000 deposit plus $199 per Month, it could possibly double its sales volume! An awful lot of Honda Clarity articles lately. Name one other Mid-Sized Affordable Plug-in. The car deserves plenty of articles. Oh, well that justifies having an article comparing the PHEV with a couple of lease-only extreme-compliance versions that sell in tiny numbers. If you look at how active the Honda Clarity section of the InsideEVs Forum is, I’d say there need to be a lot more! When it comes to BEVs, there are Tesla cars… and everything else is an also-ran. When it comes to PHEVs, there is the Honda Clarity… and (with GM ending production of the Volt) everything else is an also-ran. I never realized the Clarity Electric is lease-only… Kind of discouraging along with the fact that it’s only available in two states. It’d be perfect as an around-town commuting car, plus the fact that it has DCFC installed as well so you can top off if you have to go a little farther. The range is really last generation. No point in buying one. They are cheap, that is point enough for many. Where else do you get a $200/mo lease with 20,000 annual miles? If you don’t drive more than say 50 or 60 miles per charge opportunity in a mild climate you would be getting an incredibly affordable vehicle. A lame EV, a pointless FCEV, and an impressive PHEV. Which do you think Honda really wanted to sell? No wonder the PHEV won this comparison. The other two are pretty much useless. They are all equally ugly tho. Well if there was nothing else on the market – we’d have to buy the 89 mile Clarity Electric. There’re worse things that could happen in Life. The answer is none of the above of course. The FCEV is just foolish. Who wants to pay more than gasoline for equivalent range for a car that costs too much, and is not that good for the environment because at least 67% (California rules) of the hydrogen would come from CO2 producing dirty hydrogen from steam reformed methane? The plug in is great, drove mine 29,000 miles this year. Approximately 17,000 miles EV only 12,000 miles on gas, vs 29,000 gas miles in a much worse mpg minivan. Nothing obsolete there (it is priced much less than Model 3). BEV is low range, but incredibly good lease deals (you can’t buy). FCEV is what it is, again, lease only (you can’t buy). I’m sure that will come as a great surprise to the scores if not hundreds of Clarity PHEV owners posting to the InsideEVs Forum. Most of them, in fact the overwhelming majority, seem pretty happy with their cars. Of course that’s a self-selected group of those who care enough about their cars to seek out a forum and post about it; but still. PHEVs won’t be obsolete for many years, or possibly even decades. People were pretty damn happy with their horses. I fail to see the comparison between horses and Clarity PHEV. Please elaborate. The Clarity PHEV, even though using some gas, will have a very large positive impact on emissions and costs much less than BEVs with similar long distance capabilities. As PHEVs go, a solid effort. And for right now, PHEVs aren’t a bad choice. But assuming you’re going to buy rather than lease, bear in mind that you may be driving this vehicle into the 2030s. If gasoline infrastructure starts degrading by then (as is likely, IMHO), then you’ll be stuck with a 50-mile EV that’ll be harder and harder to either fuel or repair. The future always happens much more slowly than people think it will. They said the same thing 8 years ago – Unfortunately there are new plug-in vehicles available to me then that are not available now, and soon, others will not be available. Under 2% of people in my state buy plug-in vehicles. For the arithmetically challenged that means over 98% buy something else. So the stuff I buy where I buy it, isn’t even a rounding error yet. More ICE vehicles were manufactured in 2018 than any prior year excepting possibly 2017 as I don’t have Chinese and Indian figures – and that is due to economic downturn – not substitution by something else. All that stuff won strictly on PRICE. Not exactly in electric car’s favor at the moment but it is SLOWLY getting better. For instance, GM thinks it will take its current $145/kwh battery cost to under $100 (presumably by buying from China where it looks like they’ll be getting everything else). All this presuposes the $USD will remain the World’s Reseve Currency. Long Term I wouldn’t bet on it since the Petro Dollar is dying. Unfair comparison due to the fact that more PEV buyers are available and less political bashing. The BEV range almost makes me think they limited it on purpose so it does not compete against the other models and to claim no-one wants BEVs. Really, 25.5 kilowatt-hours when so many other budget models have 33 to 50 kilowatt-hours batteries? It is like they want it to fail. No, it is like they had a FCEV selling 50 cars a month and needed something else to sell in the chassis to keep production going so they shoehorn in a small battery and PHEV variant. Just figure it as a freebie. The PHEV is the one selling all the volume, the FCEV is a technology showcase. My hunch is they start selling this PHEV in other similar sized platforms like the Odyssey and Pilot. They wanted the vehicle to have a trunk. If batteries were like hard drive trajectory, they’d have a 2,000 kwh battery in the thing. Then you plain just wouldn’t have to have ANY public charging since any place you wanted to go would be within range. If they needed to keep the battery size down to have a trunk, how the hell does Tesla have a similar sized car with an 80kWh battery and 2 trunks then? The Clarity PHEV is on a platform the size of the Accord (it is different but maybe related platform, and can probably use similar production lines). This doesn’t give as much room between the unit body rails as a completely new platform would. If you look at images of the “honda clarity phev chassis” you will see it uses a floor pan battery like Tesla, with a cutout for feet and a raised portion under the rear seat, but it is not nearly as wide. A limitation given the platform it is on. The front trunk is obviously an engine on the Clarity PHEV, Clarity Electric has a bunch of power electronics under there and typical cooling system parts. Again, probably a limitation of design and using existing production equipment, etc. Point is this platform was developed for FCEV, but made a EV and PHEV on the same as they could without much additional cost. A new platform would be incredibly expensive. On the “S” they did it by putting it the 12 volt battery in the way on the WRONG SIDE of the passenger wheel well (you have to take apart the front of the car to get to it), and Canadian friends have told me in Cold weather you go through one 12 volt proprietary battery (the corner CARQUEST battery won’t fit) every 4 months , besides all the other crap they put on top of the battery before you change it out. Of course, they only keep the car for 3 years because no one could afford the maintenance of only this one goofy thing out of warranty. And then there is the $1200 Tesla repair cost for Door Actuators, which in cold weather break at $4800 per pop when they all try to ‘present’. They probably lack access to a good cheap source of batteries. They better remedy that if they want to compete. The issue here is a company has to commit to ordering a large volume of batteries. All of them have access. Most won’t. VW has of course (issued $48 Billion, with a B, worth of supply contracts recently) and BMW and Mercedes are starting to as well. And all signs point to Honda putting the system into the Pilot, a move that GM should have made years ago, but still refuses to do. If the PHEV Pilot ends up being affordable I will be strongly interested, they should do the new Passport (two row version of Pilot that is just being released) as well. I think the mistake GM made was doing a small platform car like Cruze as basis for Volt. Honda picked a vehicle that shares a similar platform to the Odyssey and Pilot and Accord, the Clarity. This makes moving between any of those easy. However, it should be easy to scale up the Volt platform. No idea why they haven’t. GM isn’t particularly interested in cars – all those guys have retired. They just want the highest markup possible – but the end result one day is that GM’s market share will shrivel up (nothing to brag about these days compared to yesteryear). Silverado and GMC sales high-markup vehicles are what makes up the majority of Barra’s effective Pay Checks. For now. I’ve driven the PHEV in Wisconsin for almost a year now. Averaging a combined MPG of 146. The only drawback is the battery capacity in the cold weather. In the summer, I would get about 48 all electric, when temp is below 25 degrees, I get about 30. Just like 1st gen Volts ? First gen volt gets a range more like 20 in the cold (with ERDTT disabled I was able to get down to 15 once). I got 50 mile range in the summer. With the Clarity I get around 25 to 75 mile range. The Clarity is much more efficient than the Volt 1 in both electric mi/kwh and gas. It uses only about 12 kWh of the 17 kWh battery, so only 2 kWh more than my Gen 1 Volt and gets 50% more range. I assume 25 is in F, not C? 30 AER in cold is still better than Prius Prime typical. Again: Given the developments in the EV space in the last year or so, does anyone here think that Honda isn’t smart enough to do the R&D for a much longer range version of the Clarity EV? I would bet they’ve already done/are doing this, and they will be able to get it on the market very quickly once they perceive it’s in their best interest to do so. A move like that from Honda would be the least surprising “surprise” from any car company, IMO. I’m guessing that Honda is going to build a completely new and different car for its first long-range BEV. If they didn’t put a larger battery pack into this one, it’s probably because there isn’t room for it in that design. They probably won’t change the battery pack design, they can use higher density cells, resulting in 120-130 miles range. Those who need more range probably will be ok with PHEV version. An interesting fact is that Clarity PHEV with 17 kwh battery and ICE and second motor generator weighs only 30 lbs more than the BEV with 25.5 kwh battery (single motor I believe). So basically the I-4 engine, fuel tank, second motor, exhaust system weight pretty much the same as a 9 kwh battery. Those batteries are damn heavy. It also shows that the PHEV technology is not a compromise and is a viable solution for many applications. No. It is honda that made it look this way on purpose. Other manufacturers make way better BEV. Model 3 is lighter than Mirai and Clarity FCEV. Also honda had some home hydrogen reformer (from NG) to power homes and cars with hydrogen, complete balooney no customer bothered to buy, so they scrapped it, the FCEV will be scrapped as well. These folks are incapable to design and implement any modern tech, let alone to pick the correct trends. I don’t see how this is related to what I said. Besides, they don’t make fuel cell cars for today or 10 year from now. They are targeting 20 years from now, If you look at electric cars from 20 years ago, they where as ridiculous as FCVs are today. In 20 years time then what will be the point of fuel cell cars? They were only originally in the running due to a desire to reduce tailpipe emissions and pollution (mainly in the cities) when nothing else seemed practical. Roll forward, and batteries are now becoming so in a way that wasn’t remotely foreseen 15-20 years ago. The trend of battery improvements and lowering cost is expected to continue, and in 20 years time in most of the world new cars are all likely to be zero emission (and battery) anyway. Continuing to develop fuel cell cars will be trying to solve a problem that’s well on the way to being solved anyway. Hydrogen can be used to store energy (from solar/wind). In order to do the same with battery, you need two batteries, one to store, one to use in the vehicle. Also for heavy vehicles, hydrogen scales better than battery. Using hydrogen to store solar/wind energy is very inefficient for a couple of reasons. Firstly the whole process of electrolysis/compression/fuel cell is very inefficient in terms of energy lost to energy recovered compared to battery storage. (About 20-25% cf 75-80%). The best and greenest usage of solar/wind generation is just to use it directly into the grid, to offset generation that would otherwise be from fossil fuels. The problem with the concept of using hydrogen to “soak up” excess generation at peak periods is that electrolysis and compression/liquefaction stations are hugely expensive, and to be remotely viable need to be operated at near peak capacity as near 24/7 as possible. This is exactly the opposite to something which will soak up peaks. It is inefficient now, doesn’t mean it will be inefficient forever. Batteries were inefficient 20 years ago. I’m afraid hydrogen will always be inefficient for energy storage. The reasons are scientific – laws of physics, not technical. It requires given amounts of energy to split the hydrogen/oxygen bond with electrolysis, and given amounts to compress to the high pressures needed – and much of this energy will inevitably be wasted. Nothing can change this – not in 20 years, not ever. The difference with batteries is that even 20 years ago their efficiency was high in terms of energy in – energy out. Their problem then was down (mainly) to high cost, partly to length of time to charge, lifespan etc. These problems always COULD be overcome with technology, given the R&D, and to a large extent already have been. I am talking about the plug-in model. Who makes better EV? Tesla perhaps. A Tesla Model 3 long range RWD was 3897 lbs in Car and Driver road test. The larger Honda Clarity PHEV with 5 additional cubic feet of interior space and 0.5 additional cargo space weighs 4050 lbs. So they basically weigh the same, considering the larger size of the Honda. I have both cars here and the Honda feels one class roomier inside. The only major equipment difference is perhaps glass roof on Tesla. The numbers just don’t support what you say. Got my clarity electric last December. 19,000 miles with zero maintenance (tire rotation service warning). Wife will trade for rivian rs or honda pilot phev. Would not bite on model 3. So……. over three years, the cost will be $369×36 + 2,868 = $16,152 – and you get cards worth $15,000 of hydrogen. Which means the car itself is only costing $32 per month!?! May be a good deal if you can make hydrogen work where you live, but surely these figures can’t be remotely sustainable for Honda? Just go to show how much of a loss Honda must be making on every fuel cell car they supply? Though if the range isn’t a problem, the BEV is only $199 a month, and if you charge at home the electricity won’t cost much, so probably still a lot less per month than the FCEV will cost – even with all that subsidised hydrogen. This shows how heavily subsidized fuel cell cars are. Such a boondoggle. BEVs will ALWAYS be cheaper to operate then fool cell cars. Never mind BEV. Gasoline cars will ALWAYS be cheaper to operate then fool cell cars. Excellent, accurate analysis. Based on facts, not opinions. Thank you. Keep up the good work. Clarity FCEV: LOL! Are you kidding me? Clarity EV: Short range compliance EV. Meh. Clarity PHEV: An decent PHEV. It is interesting having all 3 available. Let’s see how they sell. Not just decent PH. Compare post subsidy Clarity PHV to Accord and Camry, and Clarity PHV is lot better “bang for buck”. Now if Honda dealers have sales, it’s hell of a bargain, comparable to even some compacts like Civics. There is no need to give the pointless FCEV any face. Just call it as it is. PS Honda needs a longer electric only version instead of wasting time with FCEV. I know the japanese government is pushing them but they should just tell the government the reality. No kidding. It is staggeringly myopic to claim the FCEV is the fastest to refuel. Tell me, when I run out of H2, how long will it take to have my car shipped to CA to get refueled, then shipped back (because a 366 mile range is not going to get it back here)? Of course, that ignores the fact that I would have to go to CA in the first place just to buy the thing, and again, have it shipped back. $15K of free H2 isn’t going to do much to pay for those shipping costs every time the tanks are empty. And even if I lived in CA, a wide detour to one of ~40 fueling stations in the entire state cannot possibly be as fast and convenient as plugging in a home EVSE at the end of a day. The majority of people that buy a plug-in car choose one that accommodates most or all of their daily driving needs, so that is frequently all that is needed. Obviously that is excepting atypical long-distance trips, but I don’t see how a fool-cell station limited vehicle would be any more viable in those circumstances. like the engineering on the PHV (but needs fast charger) did they really have to make it this ugly? OMG!! Perhaps you have never heard of the 2018 BMW i3-REx with 98 miles EV. We are waiting on the 2019 BMW i3-REx EV range that promises to be awesome. Not comparable… the REx is a small backup battery charger, not a prime propulsion source capable of supporting normal driving. So the at in 1 cubit foot of batteries and pull out a whole engine and end up with less cargo space? So the engine and transmission fits in a 1 foot cube? Am I missing something? The engine and transmission are up front. The EV and FCEV also use the entire up front area. In the rear, the FCEV has a large hydrogen tank and the EV has extra 7 kWh of battery vs the PHEV, all in the trunk. It is where they put the batteries. There are several clarity chassis images around the web for all variations, you can see what the powertrain looks like in each. It is a cost cutting measure in terms of BEV model. It has the same battery as the PHEV, plus an additional module in the trunk, and perhaps a big hole under the hood. The PHEV model is packaged nicely, the only minor packaging issue is a slight hump in the deeper portion of the trunk and a smaller than usual pass through to rear seat. They could have gone with a hatchback design to eliminate both issues. Not sure why they didn’t do that. My guess is the Fuel Cell version needs the structural element to protect the hydrogen tank.